We love that the 2000-plus strong alumnae community is so robust in Texas. 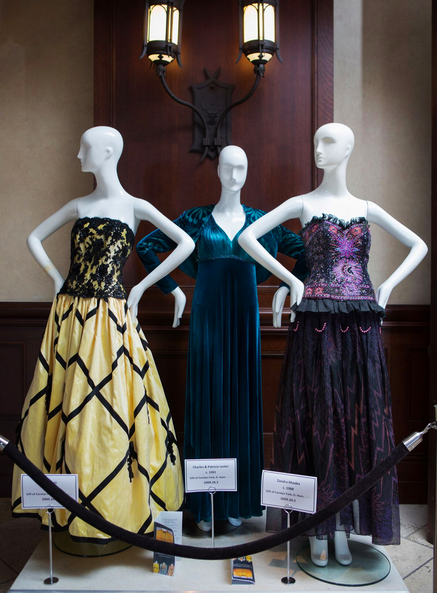 At the recent Stephens College Alumnae Club of Dallas annual fundraising luncheon, perennially stylish philanthropist Carolyn Farb was honored for her gift of three of gowns from her personal collection to the Stephens Costume Museum and Research Library fashion collection. It was an afternoon to celebrate both the Stephens tradition of excellence in the creative arts and sciences and to raise funds for a new building for the Physician’s Assistant program. In fact, Stephens College is the second-oldest women’s college in the country. The event also included a beautifully produced video by iconic Dallas sportscaster Scott Murray about Stephens and its Graduate Physician's Assistant Program; Murray was also the emcee, and the proceeds raised will help fund a new state-of-the-art building for the PA program. A delightful and moving keynote address from Hollywood screenwriter Ken LaZebnik who is the Founder and Director of the Stephens MFA Program in Television and Screenwriting, further entertained the honorees. Other highlights included having Lloyd and Gayle Bentsen, III (son of Senator Lloyd Bentsen, Jr.), among the guests (Gayle Bentsen is a Stephens alumna), designer children's clothing in the silent auction by Helena & Harry IV Co.. In fact, these same outfits were ordered by the British royal family. Plus, and getaway stays from Jackson Hole to Puerto Escondido, Oaxaca, in the live auction. As the luncheon continued keynote Speaker Ken LaZebnik, a Hollywood screenwriter and Founder and Director of the Stephens College MFA Program in Television and Screenwriting, spoke about the Low-Residency program in Los Angeles and the successes of the students. LaZebnik wrote the Lionsgate film Thomas Kinkade’s Christmas Cottage, released in 2008, starring Peter O’Toole and Marcia Gay Harden. He showed a clip of the film and told a moving story about Peter O’Toole, which delighted the audience. Guests then enjoyed lunch with lovely floral arrangements by Freesia Florist before concluding the afternoon with spirited bidding in the live auction which included getaway stays at the Benson’s Broadleaf Farm House, a Bungalow in Puerto Escondido, Oaxaca, a Townhouse in Jackson Hole, and a Padre Island Condo. Established in 1833, Stephens College is the second-oldest women’s college in the country. Stephens College welcomes both women and men into all of its graduate programs. The College’s Master of Physician Assistant Studies program is a revitalization of its PA program first offered in 1975, one of the first such programs in the country.